I work on a reward basis which is agreed upon in advance and preferably based on what the item is worth to you. A minimum per trip charge of $25 is assessed to cover fuel, tolls and parking, which is payable whether or not the item is recovered. Beaches: wet or dry sand, shallow water up to chest-deep water; sand bars; docks and canals; deep water surf and scuba zones may be extra charge; Yards, Parks, Home and Construction sites, Volleyball and Tennis courts, Athletic fields, Gardens, Estates, Insurance item recovery etc. Law enforcement and Crime scene assistance: police & law enforcement crime scene recovery (shell casings, taser body recovery, contraband recovery (foil or metal encased). Locate and recovery of metal items: Jewelry (rings, necklaces, ear and body rings, wrist and pocket watches, etc. ), antique and heirlooms, keys (hotel and car, etc. ), coins, platinum, gold, silver, cell phones, relics, etc. Naples resident married with 3 wonderful children and love God. 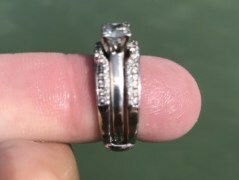 Helping reunite people with their lost jewelry and sentimental items over the past 1.5 years has become a passion and the ensuing thank-you’s and tear filled hugs are simply priceless. As a Naples resident much of my weekly routine is spent in and around the various beach areas, with which I’m all very familiar. The Lord willing, your lost item will be found, let me be the one to help. A big thank you to Mark Gruel. You saved the day! My husband Tom and I were visiting Naples Florida to attend my niece’s wedding. The day after, we decided to go to the beach , and my ring simply falls off. Friends of ours, about 10 of us, were searching the area I was standing in for about 30 minutes. Then, one of my friends found Mark Gruel. From the moment I told him where I thought my ring fell, he found my ring within 20 seconds… No exaggeration!